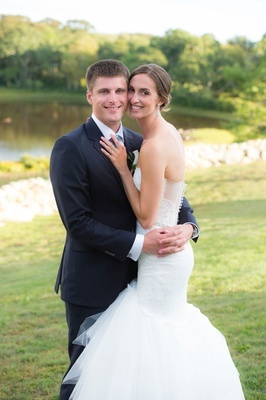 When Cassie Roberts traveled to Martha’s Vineyard over Fourth of July Weekend to visit her friend from college – who just so happened to be one of Alex Rossi’s closest friends from childhood – she didn’t expect to meet her future husband. As their relationship blossomed, the duo spent many holiday weekends visiting the place where their romance began and on one such trip over Labor Day Weekend a few years later, Alex proposed to his beloved. “I knew she was The One and felt like she checked off everything that was on my list of what I wanted in a wife and a life partner,” says the groom. 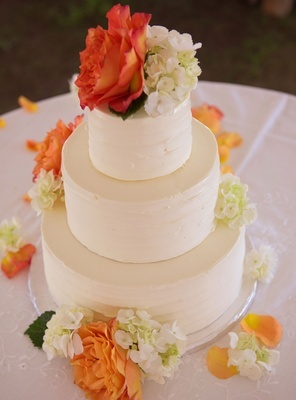 When the time came to select a wedding location, the couple’s choice was effortless: Martha’s Vineyard. “It is a special place to us,” explains Cassie. 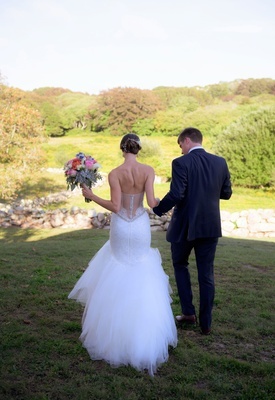 “It is where we met, where we got engaged, and we just have so many happy memories there that it seemed like a perfect place to continue making those memories.” The bride credits their team of wedding professionals, her mother, and Alex’s family for the success of their destination fête. 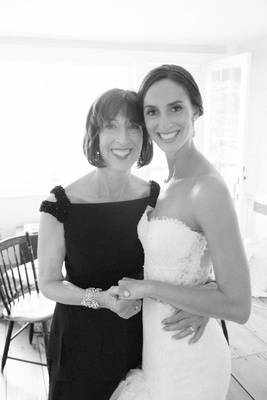 Since the groom’s parents live on the island, they “were very involved… [and] so willing to help with whatever we needed,” she adds. 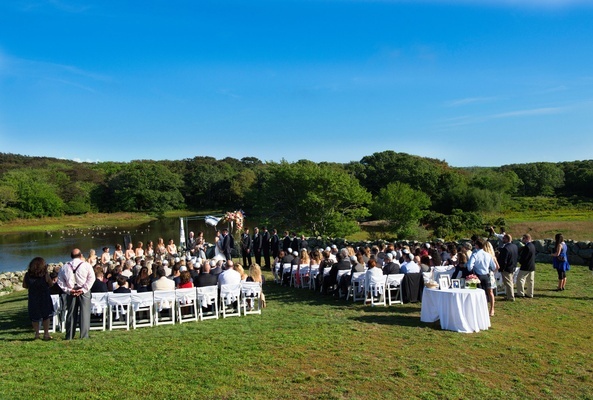 On the afternoon of the alfresco ceremony, Cassie and Alex’s friends and family gathered on a grassy lawn in front of a pond populated with ducks and surrounded by trees for the nuptials. In an effort to highlight the natural beauty of the surrounding landscape, the space was minimally decorated. An asymmetrically designed chuppah featured a vibrant floral arrangement of vanilla hydrangea blossoms, pink and apricot roses, as well as an array of additional blooms in the same hues with violet accents. The bride glided down the aisle to meet her groom in a strapless mermaid gown showcasing a sweetheart neckline and sheer back. She clutched a colorful bouquet composed of blooms local to the region paired with greenery to complement the natural outdoor space. 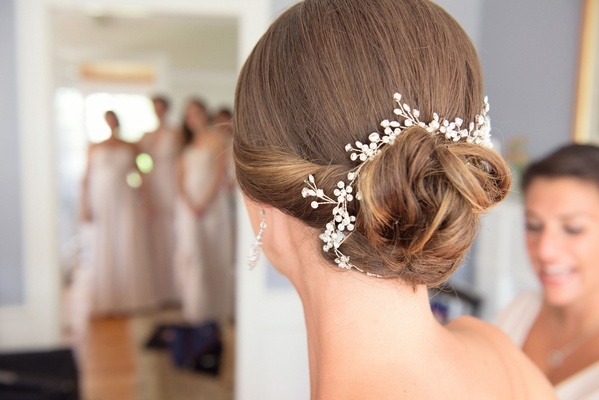 Bridesmaids wore various floor-length gowns in the same creamy hue and carried nosegays of light blue hydrangeas. 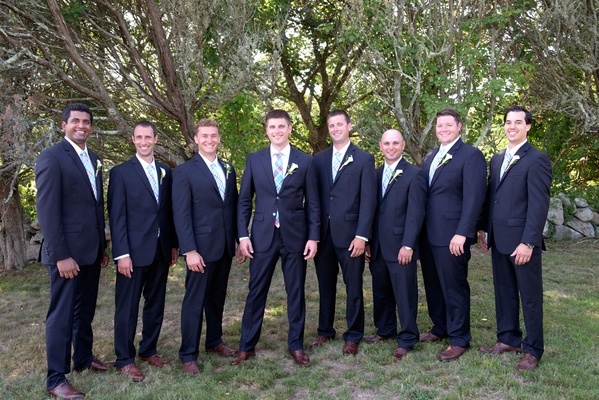 The groom and his groomsmen donned dark suits with colorful plaid ties and calla lily boutonnieres. Since Cassie and Alex have differing religious backgrounds, they desired a reformed Jewish ceremony that was both warm and personal. The couple elected to include a variety of customs, including the lighting of unity candles and the breaking of the glass, to bring their two backgrounds together. 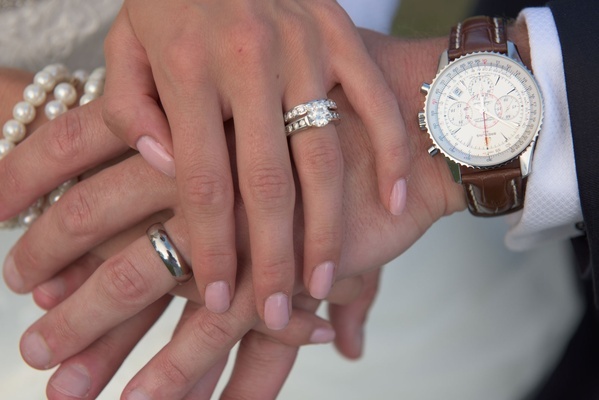 “We just wanted the ceremony to be about our love and unifying us as a couple in front of our closest friends and family,” says the bride, who was married wearing a family ring from her great-great-aunt that her cousins also wore on their wedding days. 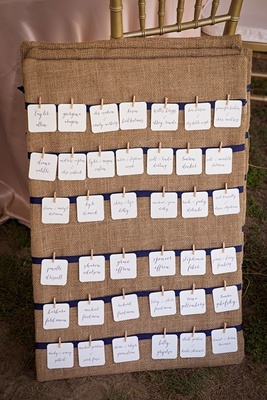 Following the cocktail hour, guests found their seating assignments on calligraphed ivory cards fastened with miniature clothespins to a rustic burlap panel. They made their way into a tented structure bedecked with string lights and paper lanterns for a sit-down dinner service. “We left a lot of the theme, color, and look to the creative genius Jacques Vigneault [of Kleinfeld Bridal], and he certainly did not disappoint,” shares the bride. 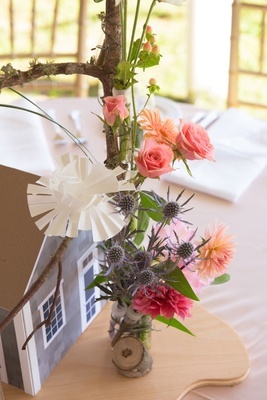 “Instead of floral arrangements, he made several miniature houses to place in the center, which is the one thing I can say I’ve never seen at any other wedding,” notes the groom of the unique centerpieces. 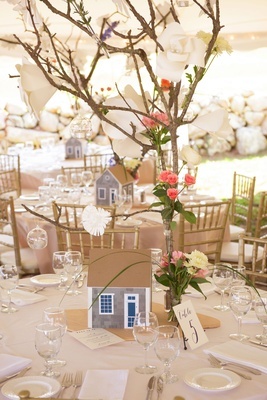 Next to the houses, which were inspired by the shingle-style homes seen on Martha’s Vineyard where the groom grew up, were towering branches adorned with fresh and paper flowers, as well as candles in glass orbs. 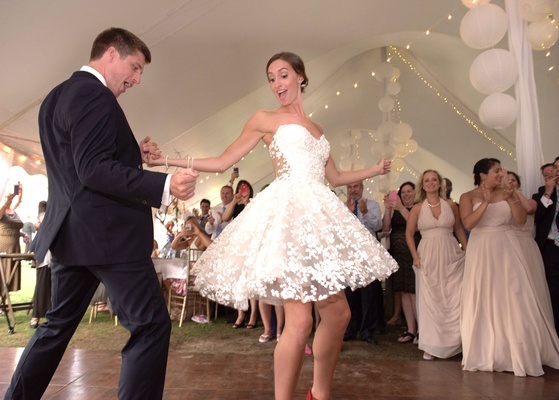 For the couple’s first dance to “Up Where We Belong” by Joe Cocker, Cassie surprised guests by changing into a second wedding dress – a dazzling cocktail-length frock embellished with intricate floral detailing. “We danced all night and had the best time with the people we love the most,” remembers the bride. 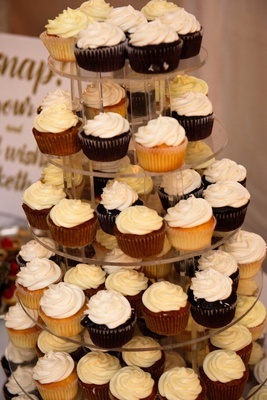 For dessert, loved ones enjoyed slices of a three-tiered ivory wedding cake decorated with fresh tangerine and ivory flowers, as well as selections from a dessert bar, which included cupcakes, French macarons, chocolates, berry-and-cream tartlets, and cookies.